bl.uk > Online Gallery Home	> Online exhibitions	> Asia, Pacific and Africa Collections	> Fort, Ramnagar [Benares]. 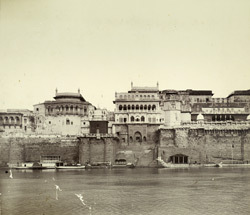 View from the Ganges looking towards the fort and palace of the Maharajas of Benares, from the Kitchener of Khartoum Collection: 'Views of Benares. Presented by the Maharaja of Benares' by Madhao Prasad, c.1905. A painted state barge with a twin figurehead in the form of horses is moored at the landing stage. Ramnagar was the made the capital of the former princely state of Benares (Varanasi) by Raja Balwant Singh in 1750. The outer ramparts of the fort date from the 17th century. A vast flight of stone steps lead to a pointed archway and a series of courtyards leads to the white tower of the main palace within the fort.